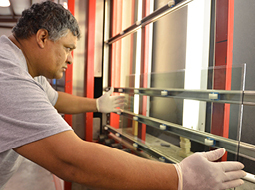 LAS windows are manufactured locally in our almost 60,000 square foot manufacturing facility. Our skilled craftsman have been perfecting their craft for years. 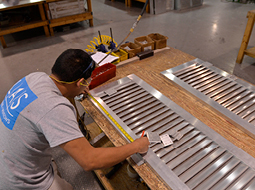 For more than a decade, LAS has been designing and fabricating aluminum shutters. From our HomeGard Shutter line to our RollGard line, LAS shutters are best in class. 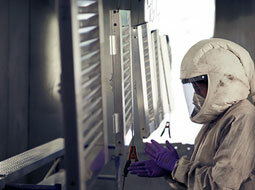 LAS uses a powder coating system to coat all of our HomeGard shutters. It is a painting system meant to last so you can enjoy the look of wood without the maintenance. Privacy shutters simply refer to custom-built screens or shutters that can block lines-of-sight into an outdoor area. You may have also heard them referred to as exterior plantation shutters or patio screens. Outdoor privacy shutters are a simple project to undertake for your home that can lead to big immediate benefits, especially if you spend a lot of time outside. Need some more inspiration for starting your next project? Here's 6 of the best reasons to install outdoor privacy shutters. If you currently have open outside areas that are virtually unused and neglected, screen them in with privacy screens to create places where you can read, entertain, play with the kids, or relax. Outdoor privacy shutters also allow you to create multiple living spaces in your yard. For example, you can create an enclosed areas for cooking and entertaining, while another doubles as a small escape area complete with hammock and loungers. Today's modern outdoor privacy shutters are easy to operate and customize, no matter the set-up of your space. Some people opt to install shutters that slide away so you can completely open up your space. Others may enjoy shutters that open outwards at the bottom to allow more airflow, while still maintaining privacy. Finally, some wall setups can be customized to operate on the upper portion only to allow sunlight in. We all treasure time spent outside. Unfortunately, blinding late afternoon sunlight, cold winds, or rain can ruin what would otherwise be a pleasant experience. Outdoor privacy shutters also double as a means to control the weather. You can let in as much or as little airflow or sunlight as you want while outside. While not being completely watertight, a privacy wall can still mitigate a significant amount of water from rainfall. If you're near a busy road, or just have loud neighbors, outdoor privacy screens can actually dampen those sounds as well. City-dwellers can also benefit from privacy screens! If you're in a populated area, outdoor privacy shutters can help you slice out a space for outside relaxing. With beautiful shutter color options and styles, these also add interest to a small patio while saving necessary room. This may be the major reason people install outdoor shutters, but it's also the most important. With a simple project, you can create a private, restful space where you can truly relax. 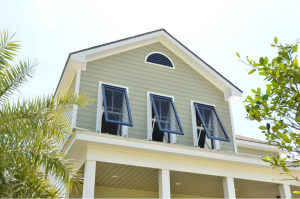 Whether you have sight to the road, are close to a neighbor's house, or have walkways near your home, these shutters block off any lines of sight so you can ensure you and your family's safety and privacy. At LAS Shutters + Windows, we're experts in designing and installing beautiful shutters around your home. 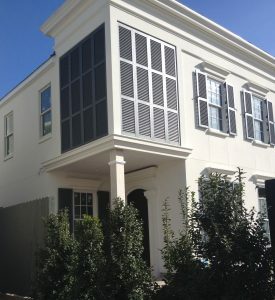 Outdoor privacy shutters must be strong enough to withstand our hot and humid Louisiana climate, which is why we always construct our shutters from high-quality aluminum with a durable powder coating. 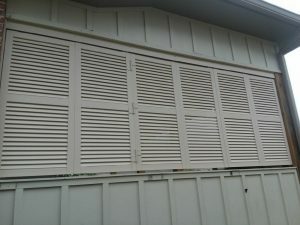 If you're ready to get started on your outdoor privacy shutters project in the New Orleans area, give us a call today. Our shutter professionals can provide a free estimate for the design, construction, and installation for your project. 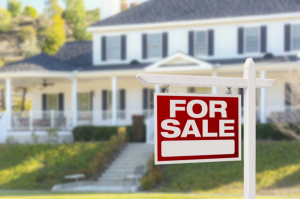 Will Replacing Windows And Siding Add Value To My Home? 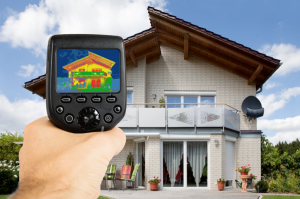 What Direction Should Windows Face For Energy Efficiency? These shutters really enhance the beauty of our home and the guys from LAS that worked on our home are CHAMPS! Installers were professional, courteous, and very respectful of our property. Efficient, courteous, and all-around great staff! 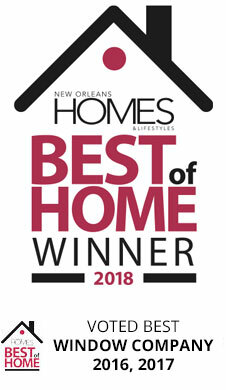 On behalf of Lighthouse Louisiana (formerly The Lighthouse for the Blind), please convey my thanks once again to your coworkers for supporting our summer camp for children who are blind. It is a rare thing to see a corporate family like yours, where people get together and give from their own hard-earned paychecks to local groups that are doing good work in the community. As donors, sometimes it’s hard to know what donations to organizations we care about are actually being used for. We consider LAS an important investor in our work, and we cannot thank you enough for helping us serve our clients. I am writing this note to let you know that the three gentlemen that came to our house were polite, neat, and clean. Especially Brad Batt, who worked both inside and outside and did a very good job. Thank you. We just finished getting new windows from LAS and I can’t be any happier. From start to finish, this job was done professionally. The salesman, Garrett, came to the house on time and explained the windows and the process and answered any questions that we had at the time. He indicated the person who would do the measurements would call and set up an appointment within two weeks and the the windows would be built and installed in about 5 weeks. Well, the job – from the initial estimate to complete install – was three weeks. The installed that completed the job did an excellent job of install, caulking and cleanup. We can’t give them a higher rating. The most amazing thing so far is the look and how much it has cut down on outside noise. I highly recommend LAS and since they are local, from repairs to employing people, we keep it right here at home. We are very satisfied customers. LAS and its employees were great – the window I purchased looks great! Great sales department and installation crew. I am VERY happy with my new windows and installation! Workers and expeditors were very helpful and knowledgable. The crew did an amazing job installing my shutters. The installers did a fantastic job. I would recommend LAS to anyone! The installers did a fantastic job. (LAS) workers are excellent. They paid close attention to detail and were responsive to any questions asked. The sales department, office staff, and installers were great. A job well done. I am so pleased with my new windows – they look great! Let’s Get Started! Talk to the experts today.